Well, it is officially official - Jessica and I are taking the boat south to Mexico. The Alize' has had a great home at Marina Village and I recommend the marina to anyone in San Diego - but all good things must pass. I still have a long list of items I need to purchase in order to make this trip a reality. However, we just checked one item off the list last week. Jess and I picked up a very fancy solar generator from a company called Kalisaya. The unit we have is the larger unit called a Kalipak 601. It has a large lithium ion battery and is set up to charge many USB devices and 12 volt components. Here is the solar powered generator on the bow of my boat. That is a foldable 40 watt panel - that can be used to top off the lithium battery. 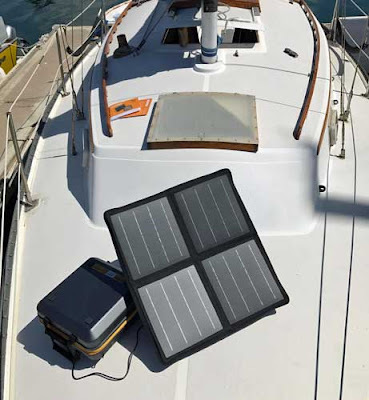 We will use the panel to keep the battery charged as we are anchored out for long periods of time. Our thinking is that - this is a nice system to compliment the 20 watt panel that is topping off our battery bank. I really liked the way you have started the preparation for mexico adventure unlike others. I am wishing you a very good time there.